Dubbed Estadio la Peineta during reconstruction, the new Atletico stadium until today bore the name of former athletics stadium that existed here before. Its large main grandstand is now part of the football-specific seating bowl created for Atletico. But only the structure remains from today onwards, because the name is changing. 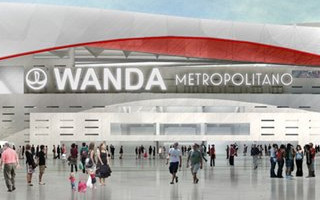 From now on the stadium is named Wanda Metropolitano. This was announced during a special conference at Estadio Vicente Calderón. New stadium’s first naming rights partner is exactly the company suggested by most journalists after Wanda Group recently bought 20% of Atletico’s shares. While Wanda was anticipated, the second part is more surprising. Metropolitano is a name associated with Atleti’s former ground, where they played in 1923-1966. This way the commercial name is both unique and provides a link to club tradition. It was previously announced that Atletico are looking for at least 5-year long naming rights contract, worth no less than €10 million annually. We are yet to confirm details of the final contract with Wanda. One downside that surfaced before today’s announcement is further delay of construction works. Having already been postponed numerous times, the new stadium is now set for opening no sooner than in September 2017, meaning it won’t even be ready in time for the 2017/18 season opening. Atletico have already applied to play two first games away.